NEW YORK, New York — On June 12, Pascale Crozon, a member of the National Assembly of France and representative of the Rhone Department, visited the No. 10 School in Abovyan, a city in Armenia’s Kotayk Region. The purpose of Mrs. Crozon’s visit was to witness the fruition of a project which she had personally sponsored. Thanks to Mrs. Crozon’s contribution of 10,000 euros and through the efforts of the Armenia Fund’s French affiliate, five classrooms of the No. 10 School have been equipped with new furnishings — including 180 chairs and 90 desks for students as well as a teacher’s chair and desk, a bookcase, a blackboard, and hangers for each of the five classrooms. Mrs. Crozon received a warm welcome from the school’s principal, staff, and students. During a special event held in the parliamentarian’s honor, the students presented a French-language performance dedicated to French-Armenian friendship. In his remarks, No. 10 School principal Vardan Petrosyan thanked Mrs. Crozon and conveyed the students’ and teachers’ gratitude for her gift. The principal also expressed hope that the furniture project would be followed by the establishment of a computer room at the school, with support from the Armenia Fund. Bedros Terzian, chairman of the Fund’s French affiliate, spoke of the French-Armenian community’s overarching goals with regard to assistance provided to the Armenian homeland. 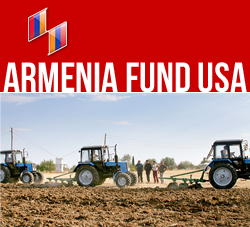 “Our top priority is to help improve the lives of Armenia’s children as well as rural communities as a whole,” he said.